Steffi is a very good friend of mine and, like most of my friends in America, she does not cook. But she loves what I do. I still remember when, a few years ago, The NY Times wrote an article on Gustiamo (West Farms; Under a Tuscan Sun (Near the Sherdian Expressway)) she was the first to call the house at dawn (she is an early bird, too) and she was almost more excited than we were. Steffi just came back from a cruise to Croatia with a lovely gift – only for me: a bottle of Ekstra Djevicansko Maslinovo Ulje, or Extra Virgin Olive Oil. I was impressed by the extensive information on its label: even if I am not exactly fluent in Croatian, I understood that they mention how the oil is made (only mechanical process), where it is made, when it was bottled, how it should be stored, the acidity level and …LISTEN TO THIS… the perossidi level (if that is “peroksidni broj” in Croatian). Very impressive! This is information I never saw on a bottle of olive oil, before. More on the perossidi, later. I learned that this olive oil is made by Vilma, a small company that, in addition to making olive oil (only extra virgin olive oil – good for them! ), also has a bakery where they make the very famous (in Croatia) cake of Rab. Vilma is located on the island of Rab which has a long tradition of olive growing and sheep herding (like Molise, then). Hence, Vilma also makes pecorino cheese in EV Olive Oil. Francesco Travaglini, are you reading this? Finally, we could open the olive oil and taste it. It was delicious and, as you can see from the picture above, we finished it very quickly. Grazie Steffi! If you wish more information about Croatian extra virgin olive oil, than this web-site could be intresting for you to read. Thank you Roman! We support ALL producers of good olive oil. 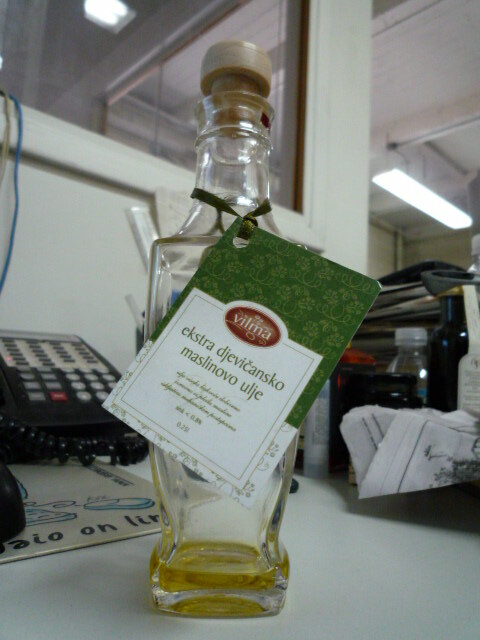 Olive Oil from Croatia is great! And we’d love to hear more about it. Grazie!